I chose this recipe because my family love it. I used to cook this for myself, my husband and our 6 children. The quantity can be halved for less people, or multiplied for more. Sift the flour and salt into a basin and make a well in the middle, crack the egg into the well and add a little of the milk. Beat well until smooth using a blender. Gradually add the milk, beating well all the time. When completely mixed, chill in the fridge for at least 1 hour. Set the oven to 200oC (fan assisted). Put the sausages in a roasting tin with the fat or oil and cook for 5 mins. When the fat is smoking hot, remove the batter from the fridge and add a splash of ice cold water, and mix well. 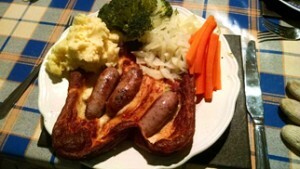 Turn the sausages and pour the batter into the tin and leave to cook for 30 mins without opening the oven door. When cooked serve with your favourite vegetables. I use broccoli, carrots and cabbage to add colour and your favourite gravy. My husband loves his potatoes, so I cook those for him.